The Shadow Giller Jury can hardly complain — this novel ranked high on all our lists. And if we had listened to Kimbofo, who ranked it first, we would have completely agreed with the real jury. Kimbofo’s review is here, Trevor’s is here and KfC’s here. I have been reading the Giller long and short lists since the Prize started 17 years ago and this was, for me, the strongest year in memory. You can find links to reviews of all the shortlist titles and almost all of the longlist in the sidebar on the right — I assure you it is worth the time to look into all of these books. This entry was posted on November 8, 2011 at 9:45 pm and is filed under 2011 Giller Prize. You can follow any responses to this entry through the RSS 2.0 feed. You can skip to the end and leave a response. Pinging is currently not allowed. It was an exceptionally strong list of books — and almost any one of them could have won this prize. Still, I’m delighted to see Half Blood Blues take the $50,000 gong — it’s a good choice! Congratulations on your blog milestone: passing 250,000 hits. its fitting that it coincided with Giller prize day! Let me add my congrats to this! PS>> Looking forward to your review of Ghost Light. Hope I haven’t “oversold” that book to you. Kevin, I don’t always leave comments, but I do check in often. Here’s to the next 250,000 hits! Thanks, Isabel. I know you visit regularly and do appreciate your comments. Congratulations Kevin, and all the shadow Giller team, on another year of interesting reviews! I’m always a few months behind the book times but I’m looking forward to reading many of the books on this year’s list! Shawna: I hope you have found some novels that are worthy of your attention as Western Canadian winter unfolds. Also, keep an eye out for Adam Gopnik’s Massey Lecture series — it may be even better when the season itself arrives. Both Kimbofo and Trevor offered excellent reviews of Half-Blood Blues. Thanks you! And let me add my congrats to your milestone. 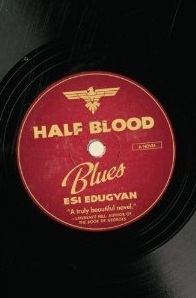 I also reviewed Half-Blood Blues on my site. Check it out if you’re interested. In this post, you’ll see I’ve recommended your site to my followers. Deborah: The three of us were all impressed in different ways with the book — I hope our opinions are of value to those who are considering it. We all agree that it is worth reading. Kevin, what is the difference between the Giller Prize and the General Governor’s Prize? I’ve seen each described as the “most prestigious” of Canadian literary awards…what’s your take on this? Thanks in advance! Liz: The G-G is older by some decades and certainly used to be the primary prize in Canada. It is government-supported — there are seven awards in both English and French ranging from fiction through poetry to drama and children’s work. My impression would be that the G-G’s have tended to be “writer-dominated” (although not always) and the winners are often more reflective of writing challenge than reader accessibility. The Giller arrived about two decades ago when Jack Rabinovitch decided to recognize the literary efforts of his late wife, Doris Giller. Jack put up a bigger prize and, perhaps more important, underwrote an invitation-only, very fancy dinner in Toronto to announce the prize. The Giller had little trouble recruiting some attractive sponsors and partners and immediately moved to the first rank. I pay attention to both. For me, the Giller is the primary prize — and it ends up selling more books. The G-G continues, for me, to be a more “writerly” prize — and there is nothing the matter with that.